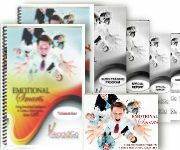 Teleseminar & Self-Study Coaching Program: Emotional Smarts - Using EQ to Create a More Joyous, Richer Life from Ready2Go Marketing Solutions, Inc. It doesn’t take much to realize that our emotions, and our emotional state, have a great deal of influence on almost everything we say and do. But despite this truth, few people seem to be aware of their emotions at any given moment. Consequently, they don’t know how to handle life’s ups and downs or cope with any number of life difficulties. And they have never considered the idea that emotions are something that can be effectively managed rather than suppressed. That’s where the concept of Emotional Intelligence comes into play. Much has been discovered in the past few decades on how our emotions play such a significant role in our everyday success. It may sound too simple, but by becoming more aware of our own emotional state at any given moment in time will we see a profound ripple effect on our daily interactions with people. Stated bluntly, there is little that equals the power of our emotions if only we are open to learning how to effectively recognize and use this powerful resource. In this program, participants will learn how to enhance their emotional awareness and make emotions work for them through the concept of Emotional Intelligence. This concept can help a person build more productive relationships through a greater understanding of the impact emotions have on everyday interactions. Without such insights, even seemingly successful relationships may end up courting disaster. Emotional intelligence can provide a person with the skills that will positively impact their whole life. Define Emotional Intelligence and be able to explain the true nature of what it means to be emotionally intelligent. Understand how emotions influence a person’s thoughts and actions. Increase their self-awareness and explore how tuning into themselves and becoming more aware of their thoughts, feelings and actions increases their ability to manage their emotions and relate to others. Raise their awareness of the emotions of others. Emotional intelligence involves learning to manage our own emotions as well as increase the connection to others. Human beings are inherently social. As they tap into this social awareness and manage their relationships, they’ll see a return benefit in being able to listen, support and empathize more with others. Participants identify strong emotions they have experienced in their lives and begin to explore the true nature of what it means to be emotionally intelligent. Part 1: What is Emotional Intelligence? An exploration of the concept of emotional intelligence. Participants explore the link between thinking and emotions in brain function. Participants tap into emotions they are experiencing in the present moment, and explore the idea that self-awareness is what leads to self-management. An exploration of the five emotional domains. Participants identify personal tactics that would be most helpful to particpants in improving their emotional intelligence skills. Participants identify the social tactics that would be most helpful to them in improving their emotional intelligence skills. The program concludes by giving participants sharing their key learnings. 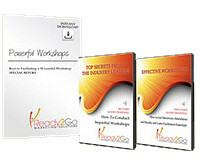 Turn this teleseminar into a webinar! You can now get the corresponding webinar slides for this topic, and combine with the teleseminar to have a visually stimulating webinar. Each webinar is professionally crafted and designed to increase participants learning and understanding of the materials presented. All you'll need to do is download the file and present the webinar! It's a complete Ready2Go webinar!